Amid concerns over skills lost to the public sector as the Baby Boomer generation retires, a silver lining exists. Millennials in the U.S. are more diverse and more likely to be multilingual. A discussion of the possible benefits highlights service provision, cross-cultural competency and collaboration capacity. One of the ongoing concerns about the public sector workforce is the loss of talent and experience from an expected wave of retiring baby boomers. In fact, by 2017 a third of federal career employees will be eligible to retire and 28 percent of public administrators at all government levels will be 61 or older by 2018. Language capacity is an ongoing concern for the federal government and an increasing concern for many local governments. According to Hispanic Outlook in Higher Education, a 2009 Government Accountability Office (GAO) study found that one-third of State Department employees didn’t meet the language requirements for their position. In Iraq and Afghanistan, the rate reached 57 percent and 73 percent respectively. Senate hearings in 2000 noted that it cost as much as $70,000 in tuition for foreign service officers to become proficient in a desired language. Other research compiled by Gail McGinn notes that as many as 80 different federal agencies and 25,000 – 34,000 actual positions require non-English language capacity to carry out their mandate. 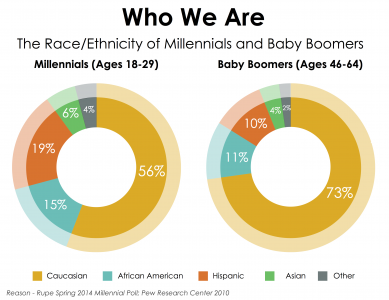 In terms of ethnic diversity and language capacity, the millennial generation is distinctly different (see graphic). Since 1965, increased immigration reshaped the ethnic landscape of the United States. Recent figures from the Pew Research Center show this impact: whites as a percentage of the total population fell from more than 80 percent in 1965 to just above 60 percent today. This increasing ethnic diversity also means that more Americans are bilingual or multilingual. 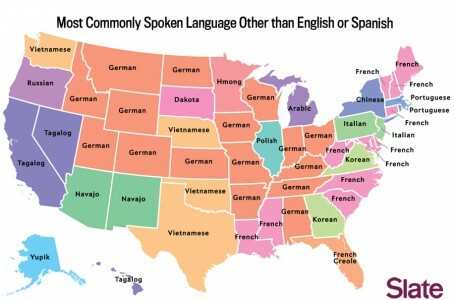 (For a deeper insight on the evolution of language diversity in the U.S., check out this article by Rumbaut and Massey.) Reports estimate that 38 percent of today’s millennials are bilingual – among Hispanic millennials the proportion of the group who are bilingual has increased from 22 percent to 38 percent from 2003 to 2013. Such language diversity is important for several reasons. First, multilingual employees don’t require expensive language training if they enter a job already speaking all needed languages. This is important, especially to an increasing number of local governments that have diverse language populations in their community and need to increase staff capacity to provide services to those communities. And while Spanish is the most common non-English language in the U.S., the diversity of additional languages in this map from Slate is striking. The article goes on to note that children raised around multiple languages become more adept at contextualizing signals (verbal and nonverbal) based on the identity of the speaker—in essence, developing the skill to make culturally informed assessments of a situation. The implications of this research for administration are numerous, but two deserve to be highlighted. In an era in which public administrators are increasingly aware of the need for cultural competency (a broader concept than simple language competency), this research suggests a multilingual workforce and millennials may be better equipped, not only in relating to the cultures in which they were raised, but also in relating to new cultures with which they have little previous familiarity. The exact role millennials will play in public governance during the next several decades remains unknown. However, recognizing the range of skill sets they bring is likely to partially offset the wisdom and experience being lost as Baby Boomers retire. Author: Grant Rissler is a Ph.D. candidate in Public Policy and Administration at the L. Douglas Wilder School of Government and Public Affairs, Virginia Commonwealth University (VCU). A former immigration paralegal, his current research focus is local government responsiveness to immigrants. He also serves as assistant director for programs for the Commonwealth Educational Policy Institute at VCU. Grant can be reached at [email protected].